"We don't want to walk away from that at all"
If you haven't heard, Nintendo has announced the latest addition to its handheld family, the 2DS. Many people are wondering what this means for the 3D feature incorporated into the 3DS and 3DS XL and Nintendo has been quick to point out it is still very much a part of its future plans. In an interview with Games Industry International, Nintendo's executive vice president of sales and marketing Scott Moffitt said the introduction of a 2DS is certainly not an admission that 3D was not a big deal to begin with, and pointed to the healthy install base the system currently has. Clearly our development efforts all include 3D games. Our installed base, we have eight million units installed. If 3D wasn't selling and wasn't part of our future, we wouldn't be seeing and enjoying the robust sales we have on 3DS right now. I think you know that the 3DS is the number one gaming platform on the market. We're having a very good year with 3DS. Our games continue to sell extremely well ... This is really all about addressing that next opportunity in the US market. Of course, there are many games for 3DS that utilise the 3D feature brilliantly, with the likes of Super Mario 3D Land and the upcoming The Legend of Zelda: A Link Between Worlds, and Nintendo plans to carry on developing software such as this for the 3DS. Of course, it will all be playable on the 2DS, it just won't be in 3D. There's a lot of great 3D experiences that gamers have come to love. We don't want to walk away from that at all. Moffitt said this move is all about targeting a new market rather than replacing the current models. Nintendo currently feels there is a barrier to entry for some consumers and the 2DS breaks down a few walls with its imminent release. He made reference to DS owners who haven't yet upgraded to the 3DS because of price and because they still enjoy playing their old DS games. Then there are the young children just entering the video game market who need a more affordable and sturdy console. Now we're much closer to $100, which makes it much more affordable for them. I think that was probably the audience we expected or intended to design the unit for. Removing the 3D element allows Nintendo to manufacture the system at a lower cost, meaning the saving can be passed on to the consumer. Moffitt revealed a 3DS with a price point lower than $129 is looking increasingly unlikely and the 2DS offers a solution to this problem. It's less about wanting to have 3D in and it's more about trying to get to the value price point that's going to allow us to open up that next part of the market. Another aspect gamers are concerned about is the size of the 2DS and its inability to close. However, Moffitt believes it is still portable, though children do not carry their system in their pockets as much as they used to, hence why a carry case is being added as an optional extra. I think portability is still a factor. My point is just that I don't think kids fold it and put it in their pocket very often. This shouldn't be any less portable than a base 3DS or a DS today. But portability is clearly important. With the new addition, gamers may be tempted to pick up a 2DS to play 2D games, such as the ones found on the Virtual Console; however, as purchases are connected to a console and not an account this could prove frustratingly difficult. Moffitt said Nintendo is working on fixing this problem, as it has shown with the Nintendo Network ID on Wii U, but has not devised a solution for the handheld yet. Meanwhile, President of Nintendo of America Reggie Fils-Aime has been speaking to IGN, where he said the 2DS will be great for those aged between five and seven who are looking for their first handheld gaming device. We’re always thinking about what we can do that’s new, unique, different, and brings more people into this category that we love. And so with the Nintendo 3DS, we were clear to parents that, "hey, we recommend that your children be seven and older to utilize this device." So clearly that creates an opportunity for five-year-olds, six-year-olds, that first-time handheld gaming consumer. You can read the full interview with Scott Moffitt over at Games Industry International. What are your thoughts on the Nintendo 2DS? Let us know in the comment section below. Honestly what's the end game? Release two versions of all future handhelds? One w/ [optional] 3D, one w/ only 2D? Where do we go from here? The very existence of the 2DS is proof that just a single model with optional 3D is not enough to capture all of Nintendo's target audiences. I think it's pretty clear it is aimed towards young kids. It look much less like a gadget and more like a toy. It seems like a smart move. Even though you can turn the 3d off, some parents might feel uncomforatable buying something with a feature that is labeled as potentially harmful to kids under 7. We'll see in the sales. I don't care about the 3D either way. (I do care about 60fps though and sacrificing 3D if necessary for it is always worth it as far as I am concerned). I hate the way the 3DS XL makes DS games look as well. (Think I will get a DSi XL for them instead). Just you wait and see. Sure, Nintendo won't back out of 3D games, but plenty of third-parties are bound to start making quick-and-dirty 2D games. That's a relief. I can't imagine why a 2DS is better than a 3DS with the 3D disabled, though. It sounds like damage control BS from Nintendo to me. 3D is nothing more than a gimmick that Nintendo now realizes is not what's selling 3DSes. Now I want to know the battery life for this one. I hope it is similar to the XL in that regard. I hope this isn't an out for companies to not make games in 3d! I play all my 3ds games in full 3d. Now gaming just doesn't look the same in 2d anymore! I haven't purchased a Nintendo handheld since the GB Micro. This might be my next one. I love that Nintendo does this with almost all of their consoles (see the NES 101, SNS 101, Wii Mini), but they always produce them at the end of a console's life. I was waiting for something like this to finally play some DS games without the clamshell design. @Knux I don't think so. As other people have stated, it's for parents concerned about kid's accidentally turning on 3D and messing with their eyes. The 3D effect was not what sold me the 3DS. The games did. And every review I read before buying mentioned how 3D was a gimmick that everyone just turned off... However, I play most of my games in 3D mode 90% of the time. I love the 3D effect. The option to turn it off is great too for the games that don't do it well (I dont like it on for New Leaf and Heroes of Ruin) and for when traveling/saving battery. But 90% of the time... it's 3D on! I understand some people get headaches or whatever... but I love it! It's good that they're releasing a cheaper model without the 3D and it's a nice option for those who don't need the 3D to use, but the design looks so flawed in my opinion. One last thing is, how will this affect some games in future or past games that utilize the 3D if there are any to note? Great article, Nintendo Life. I have to question what the hell Nintendo is thinking here. Just play with the 3D off if you don't want to use that feature. You didn't watch the video or read the press release yet? It will still play DS games. Why don't parents just lock the 3D using parental controls so that kids won't turn on the 3D? It's a simple solution so parents won't have to buy a 2DS if their kids already have 3DS's. @Marakuto Well, closing the lid is putting the DS to sleep. So since Phantom Hourglass requires you to put the DS to sleep (close the lid) to solve a puzzle, you should be able to accomplish that on the 2DS with the sleep button. Also, while all 3DS games have a 3D effect that is utilized differently, I have not ever come across one where it's mandatory. And I doubt there will be one where its mandatory. I love the 3D effect personally, but my sister who has a lazy eye cant stand it. Which is why the option to turn off is there... which would be rendered mute if the effect was mandatory for a game. Personally, I never saw the 3D as anything more than a gimmick. Maybe its just the issue with my eyes, but I could never see the 3D properly and it seems like not many games really used the 3D effect fully. Mario 3D Land seemed to be the on the few, and even that was playable in 2D mode. I like where Nintendo is going with this. I'm not saying 3D flopped, but it does not seem to be the key selling point of the 3DS. It seems like the 3D feature has figured less and less into the 3DS' recent marketing. Maybe 3D just is not a selling point for video games? "Our installed base, we have eight million units installed. If 3D wasn't selling and wasn't part of our future, we wouldn't be seeing and enjoying the robust sales we have on 3DS right now"
The 3DS's success has very little to do with 3D. 3D nearly killed the 3DS. The console's sales picked up when you completely removed focus from the 3D. @Alpha2797 I don't think the 2DS is for anyone who already owns a 3DS. I think it's meant for people afraid of getting the 3DS because the 3D effect while optional can still be enabled by kids. @Koto I checked Nintendo's website and they've mentioned that most DS games are compatible with the 2DS and I can't watch the video due to not having flash on the browser I'm using. "Nintendo has been quick to point out it is still very much a part of its future plans." Is this the same Nintendo that has been saying all year the Wii U wasn't getting a price cut, so I bought 1 this month? @Alpha2797 I'm sure this is aimed for those parents who haven't bought a 3DS yet and don't want to spend that much money. 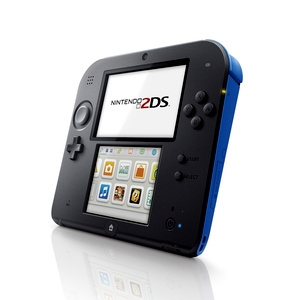 2DS is cheaper and it's the solution for those cases when the kid is five years old or something. It does seem like a good option for kids. It's cheaper, it doesn't have the 3D that kids aren't recommended to use, and because it doesn't have the two screens on a hinge, it might also be more durable. I'd say they're probably right about kids not putting the 3DS in their pockets too. I mean, the 3DS is pretty big, let alone the 3DS XL. I can fit either in my pocket, but for a kid under ten years old, it might be difficult. Nice to know someone besides myself uses the 3D on the system whenever possible. How about 3D for Wii U games? The screens are going to get scratched up really bad with that design. After all its kids we are talking about here. They don't care as much to put the system in the case. Once again you can fully lock out 3d use on the 3ds! So not needed! This seems more like a cash run but it will cut into sales of the 3ds system which was suppose to take off this holiday. Why not wait till after CHRISTmas to release this horrible looking thing! @Ronoh: From what I've read above, it's about reaching a different audience of consumers(5-7 year olds to be precise) with a lower price point and a sturdier unit. @yuwarite - No, the 8GB Wii U Basic is their PSP go. The 2DS is their 3DS Wii Mini. Besides the awful design and no 3D screen it's just to big and ugly for the cost. My 8 and 10 yr. olds got their 3DS about a year ago when they were 7 and 9. The 3DS is already aimed at kids, the 3DS XL towards adults. Not to say you're wrong, this is squarely aimed at small children, but I think Nintendo still might not sell too many. Probably more than W101 did in Japan though. Poor Platinumgames. I'm tempted to purchase for the price. I've been wanting a new 3DS for the house to play MK7 multiplayer with family members. I'm the only person that plays with the 3D on at all times in my household so they wouldn't be missing the 3D aspect of the system. Also, I tried to play Ocarina of Time with the 3D turned off just now to see how I feel about playing games on the 2DS. Then I turned the 3D back on...ah, how I love the 3D on the 3DS!! In conclusion, if you hate 3D and are not comfortable with the starting price of the 3DS, then the 2DS can be a system for you. Children especially, this system is for you too. @Shadowkiller97 You have to press both start and select to start it in that mode. I can see the market for this. The original 3DS was for those who wanted to make the next leap from DS, 3DS XL for those who wanted a bigger screen or had big hands, and now this for those who want to play 3DS without the 3D. More Streetpass folks the merrier I say! @KnightRider666 Oh I understand where Nintendo is going with this, particularly when it's to be released the same day Pokemon is coming out. I'm actually a fan of this strategy based on what they've told us so far. The 2DS clearly wasn't designed with you or I in mind. That said, my original question is about the end game though. What's Nintendo's long term strategy surrounding their handheld business if, on the one hand, they say they're completely committed to 3D, but on the other hand, they release a model like this that essentially admits the 3D is a hindrence to a segment of the population that they cared enough about to make an entirely new model for? What happens when they release the true successor to the 3DS and they continue the implementation of 3D? Are they going to release a second model that's only 2D to go after the parent/child audience the current 2DS is aiming for? If they continue to be so on board with 3D and the young 2D only audience simultaneously, will they then be required to release two distinct models for their future handhelds? Or can they somehow create a single model that caters to the entirety of the current 3DS crowd? That's what I thought optional 3D and parental controls were for but that's not the case. These are the sort of questions I have now since the 2DS was announced. The lack of 3D passes the savings to the consumer, and also prevents 6 and unders accidentally enabling 3D. One of the biggest concerns about 3DS among parents is that it may be unsafe for Kids and this device alleviates the fear. We'll see if it sells well or not; parents may buy it in droves along with Pokemon for their kids. @Ronoh: I understand your concerns and points, as they are all legit. I love my 3DSXL, and I thought that the parental controls on it would essentially eliminate the need for a sidestep like this. But it comes down to price and what parents are willing to spend on their younger children dude. A cheaper alternative that allows you to play the same games will attract a bigger audience. Some people don't like the 3D period, but still love the new games in 2D. This is a perfect way for that crowd to save $70, instead of spending $200 on a system they wouldn't fully utilize the benefits of. This makes perfect sense. A mother could easily fit this into her purse and pull it out for her 7 year old or younger child to play on during long car rides or waits (such as in hospitals). It's what parents already do with their smartphones or tablets, so why not give them a system with more high quality games and that won't break as easily as a smartphone or tablet? Except that 3DS are selling and there is no damage to control. Screen protectors, duh. The 3DS scratches itself whenever you close it. I didn't buy a screen protector and now I have a nice square etched into to my upper screen. Why would they announce a price cut early on? The sales are bad as it is, announcing the price cut months in advance would make them worse. The 3DS is already aimed at kids, the 3DS XL towards adults. Not in the least. The XL has a matte finish and a light color scheme, the 3DS has a metallic finish and a more bold and dark color scheme. The XL is larger and rounded so that it fits into kids' hands easily and it doesn't scratch as easily due to it's matte finish. You have your age groups mixed up. @KnightRider666 So judging from your response, I think I should clarify in case my stance on the 2DS wasn't clear. Despite the fragmentation of 2D versus 3D and what that means to developers, I'm all in favor of what Nintendo is doing here which I stated before. I agree with the price, the system being 2D only, the target audience, and even the form factor to some extent. I'm simply wondering what this means for the successor to the 3DS because for a time, it seemed like 3D would be the future for Nintendo handhelds. Now? Not so much. So again, just speculation, no judgement passing or anything like that. @Ronoh: I understand. Who knows at this point? What's with all the negativety? This doesn't affect anyone besides the people wanting to pick up a system that can play 3DS games in 2D as a "slate" instead of a flip-top. Just remember that this thing costs less than the DS did at launch($150) and plays those games as well as new ones for kids. It cost's less, because there's less inside. It's a budget console, especially next to any current model, and especially the PS Vita. It actually looks like it might be comfy to hold, the bottom rests more in the palms. I'd guess the battery might last longer too. edit: and at that price you could buy one for, say Japan, to get games you can't get in your region (cheap way around the region-lock). I think it looks cool. I could see plenty of kids playing this like a GameBoy or playing it while laying on the ground like a tablet. It's the coolest calculator designed machine ever. @SCAR392 It seems like some of the negativity is from people who rule out picking one up for themselves because of the form factor or some other reason. But like you pointed out, it's clearly designed for a young audience, not most of the current 3DS owners. In any case, more hardware sales will hopefully be more beneficial for all of us in the long run. I want to know why they didn't use the book design? but I guess a classic handheld look don't hurt. Smart move. I know 5 parents IRL that brought their kids dsi system instead of 3ds because it was cheaper and safe on the eyes last holiday season. Maybe my gf's sister can get this for her 4 year old son this year instead of messing with his aunt 3ds. I hope they really mean this. Because after playing handheld games in 3D for over 2 years now, I'm not interested in playing handheld games that AREN'T in 3D. I would be very disappointed if the successor to the 3DS (and 2DS) wasn't capable of stereoscopic 3D. @rjejr yeah, this is also the one (Reggie) that said Black 3eds would not / could not sell in the US (now it IS) : some BS about how we use floor space in stores,,,) & that no one wanted white (then they release PINK?!?! as though more would want THAT?!?! The white sold the ACNL game there are soooo many examples they won't allow me to fill the pages with them... My Motto: I believe none of what you hear, half of what you see and all of which you DO. ESPECIALLY with Nintendo. @Tony_342 I agree but makes me wonder where the next gen handheld will go... and don't tell me high def, I'm not sold on High Def for cartoons yet... or anything handheld for that matter.. heck maybe this move was designed to set us up (our expectations) for a single screen PAD next... the N pad heck, they could call it... a D Pad. The lack of 3D passes the savings to the consumer,...... We'll see if it sells well or not; parents may buy it in droves along with Pokemon for their kids." it's all just another extensive Pokemon pitch. They've spent millions so far on having gaming websites talk up their product, this is just another rung in their marketing. @SyFyTy: I haven't thought of that... You make an excellent point as well. Everybody's on a roll today, lol. I can't wrap my head around why people think stereoscopic 3D is a silly useless gimmick, the same people who enjoy them HD realistic graphics scoff at the idea of having realistic depth perception?.....Sorry, but the real world around you doesn't look flat/2D. 3D is absolutely wonderful when done right. It made Pilot Wings resort just magical, i couldn't even be bothered to play it in 2D. It's amazing how much life 3D can bring to a videogame, makes the experience far more immersive , eye catching and dazzling. It also can help distinguish the amount of space between objects and the like, When i was all over the 3DS during it's first year I struggled having to make the shift to play other games in 2D again! Of course it's not. No device can reach every audience. Which is why this is brilliant. It's a poor-man's 3DS, made for small kid's who would possibly break the hinges of the 3DS, and made for less fortunate folks who maybe can't afford a $170-200 price point. This will further penetrate the market and reap an ever higher install base. It will be a gateway for younger kids who are just beginning to play games, kids who are tomorrow's future market for Nintendo. Get them accustomed to Nintendo games now- get them used to dual-screen gaming now. The sell will be that much easier for Nintendo in the future. They're raising an entire generation of fans. To everyone saying why not just turn the 3D off? BECAUSE THE 3DS AND 2DS ARE NOT THE SAME PRICE. Parents will do anything to save money and while $40 seems like nothing to you, to parents, a save is a save. Not every parent is game savvy. Just because their buying kids a DS doesn't mean they know how to work one. I turn the wifi button off on my nephews 3ds but when he holds it, he always accidentally flicks it on. To truly turn off Wifi and 3D you have to go in the system, set a password and all that other stuff. Now I know gaming so it's not difficult for me, but for people who don't play games and are just buying it for their kids, setting parental controls in settings can be a pain when they can buy this and eliminate it all together. Saying the screen can get scratched? Yes it can, but kids also have a habit of banging the clam shell, pulling the top screen back to the point where you hear the click and possibly breaking it. If parents want to protect it they'll buy the carrying case. And of course it's related to the new pokemon. Why do you think it's being released the same day as Pokemon X and Y? @WaveBoy I'll admit that 3D has potential but so few games I've played seem to get anything added by it. Plus, no matter how I hold the 3DS or set the slider, I can't seem to get the 3D effect to work for me. I don't have a good set of eyes, so that might be some of the problem. It's not that I have 3D, its just that I personally have not seen any benefit. It just seems better to play most of the games in 2D mode. I hope Nintendo keep stating who the Nintendo 2DS is aimed for. Goodness knows that most people don't seem to understand the business logic behind it. They would literally have to put NINTENDO 2DS: Kids Edition for people to finally understand it. The next portable will be with one screen and without touch options. What does Moffitt mean by an install base of eight million? The 3DS has sold many times that. So, for someone like me, 29 years old, that'll probablyown this thing for 6 months to a year tops before trading it in for some Wii U credit, and will only buy Link Between Worlds, Dream Team & POSSIBLY Monster Hunter 4, this is great. Typing on a smartphone, which is why my grammar above is horrendous. Sorry. @mystman12 Nah, you only have to press one or the other. Many people dont care about the 3D but calling it a gimmick is nonesense. they certainly havent played KI:U. and for the 2DS i really think is a very smart move. lots of manufacturers have an array of different models of the same product ,(samsung anyone?) but nintendo just do the same and everybody loses it cmon guys! @Gioku Oh, you're right! I thought you had to hold both for the longest time. I really hope that he says the truth, and that 3D games keep coming!! @Ronoh Ninty has had multiple models with the DS... Absolutely nothing wrong with having more choices for consumers. @rjejr why did you think it wouldn't get a price cut? The system is selling poorly, so it was going to get one as the games start being released. You can't expect Nintendo to announce a price drop in July, it would cannabalize all their sales in between. @JuanitoShet of course gamers don't understand business. They are having meltdowns over a device that's not even aimed at them.... From what I'm gathering they think "I don't want that, that means its going to Bomba"
Not every product needs to be aimed at the "core" gamer.... Look at Ninty's advertising, they aren't targeting "core" gamers, why? Because "core" gamers check gaming news religiously, they don't need to be advertised to, they know what's coming out.... Advertising is aimed at casual gamers, people who don't eat, drink and sleep gaming news..... It's smart business 101. I very rarely use the 3D feature of my 3DS XL. I prefer playing my games in 2D. Clearly this is for kids, just by the look of it. With all the crap flying about about 3D being 'bad for your eyes' this is a simple way for under 10s to play 3DS games (ie sell more). 3D is not a gimmick at all and I never take it off. Some of the effects on Fire Emblem are awesome and its clear Link Between Worlds is utilising it excellently as well. Fret not 3D gamers, this is simply a marketing tool to get young'uns to get on the Nintendo ride early. That Moffitt interview demonstrates clearly their intentions for the system. The intro video is simple and shows how it fits into the DS 'ecosystem'. In the space of an hour I've gone from WTF to believing it's genius. The name matches the 2D slab form, it harks back to the GBA and completists won't be able to resist. It's not designed for me, it's not designed for my grandma, but the kids are gonna love it. The only issue is that 3D as a gameplay mechanic will no longer be a worthwhile option for developers. It has never really been used for fear of alienating certain players but the opportunity to play with the feature and use it as part of an integral experience may now have passed. @element187 I've already agreed that the 2DS is a great idea. I'm just taking Nintendo's message on 3D being "very much a part of its future" with a very large dose of skepticism. Any company will say anything at a time when it's convenient to them and then go in a different direction later. Just before the 3DSXL was announced, Nintendo said they had no plans to release another model of the 3DS anytime soon. Just before a WiiU price cut was announced, Nintendo said they had no plans to cut the price. And there's a reason why they do that right? Because they don't want consumers to change their spending habits because of what Nintendo may or may not due in the immediate future. But again, I'm in no way against the 2DS and I'm glad there's even more options for fans of 3DS games. I'm all for that. But on the subject of this article, I remain very skeptical of what Nintendo is saying about the importance of 3D in their handhelds. @Ronoh But surely that negates the point of the 3DS? It's popularity is of course mainly down to the games but the 3D effects used in those games enhance them and developers know that. Otherwise it's just a DS with better graphics and processor etc. I believe Nintendo that 3D is important to them, the 2DS is simply a way to sell more machines and more of the already existing canon of 3DS games to younger or less gaming market. @Samwise7 Well no, I don't think so. To clarify, my earlier statements were speculation on if Nintendo would not include 3D as a feature of its next generation handheld. I'm not referring to another 2DS or some other variation of the existing 3DS model - I'm referring to the true successor to the 3DS. Would they stop selling the 3DS and 3DSXL and only sell the 2DS or future variations of that during this handheld cycle? Absolutely not. But when the true successor does come around, they have to decide how serious they are about 3D when they know it can't work with all models. So will it be like the current 3DS with optional 3D or will it be more like the 2DS? Clearly we don't have an in-between solution at the moment because that's just a 3DS as is with the slider - which wasn't enough to prevent having to make a 2DS in the first place. I'd love to be a fly on the wall during those discussions as I find the hardware development process very fascinating. @element187 - "why did you think it wouldn't get a price cut?" um, b/c they kept saying it wouldn't? OK, that's a sorry excuse for an answer, so I'll elaborate. I've been saying since - well probably before launch - that it needed a price cut. After the poor spring quarter sales it really needed a price cut. i thought this month's early ND would announce it. But they kept being oblivious Nintendo and kept talking Zelda and Mario and DK that I thought they were so removed from reality that they had deceived themselves into thinking it didn't need a price cut, even though it was obvious to everyone it did. So I drank the cool aid and finally took Iwata at his word. Doesn't he have to fall on his sword now? "You can't expect Nintendo to announce a price drop in July, it would cannabalize all their sales in between." @rjejr Can you name a single console that didn't receive a price cut in its first year on the Market? I can't for the life of me.... PS3 cut its price not even 6 months in, Ninty cut the price of the OG Wii 1 year later of $25. @element187 - The Wii didn't have a price cut for 2 years. That's one only 6 years ago. Can you name 1 that had it's price cut announced 3 weeks in advance as opposed to "effective immediately"? I can't. That's the part I don't get, why wait? Ok now i agree this is just a BRILLIANT idea by nintendo! Now my younger 13 year old autistic bro can play NSMB2 with me when i get a 3ds! Its alot cheaper....I don't have to worry about my brother having problems with the 3d..even though i don't if he has problems with it...and overall I went from hating the 2ds to now being down with it sign me up nintendo! I believe everything they said. Just like I believed that a Robust online gaming service was coming out for the Wii. Wait a second! We never did get that Robust online gaming service for Wii.